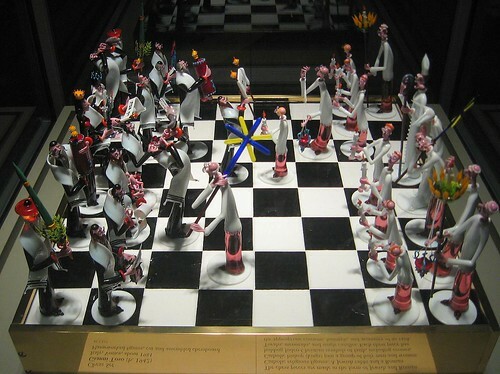 This is part two of a very lengthy and very enjoyable visit to the Corning Museum of Glass in Corning, NY. Part 1 is here if you need it. Part 3 continues the visit, and is up and coming soon. 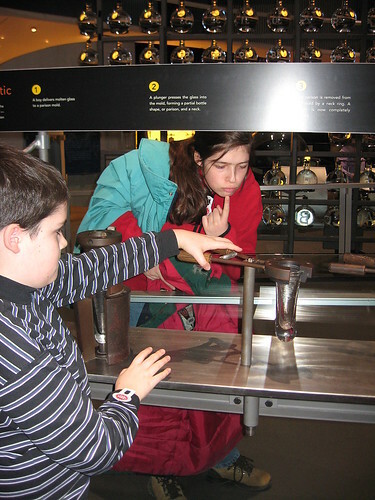 I left off with our visit in the artifacts displays and our learning about the history of glassmaking. As we progressed from the B.C. era and into the A.D. years, the improvements in techniques and inspiration was truly stunning. 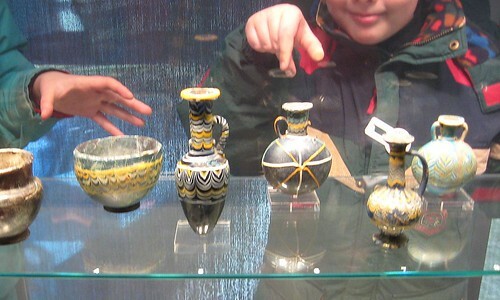 The making of glass developed from “core forming” to the discovery of blowing glass, about 250 B.C. Eventually, artisans discovered that they could made moulds, or forms, and blow glass inside these forms. This made shapes and designs on the glass. 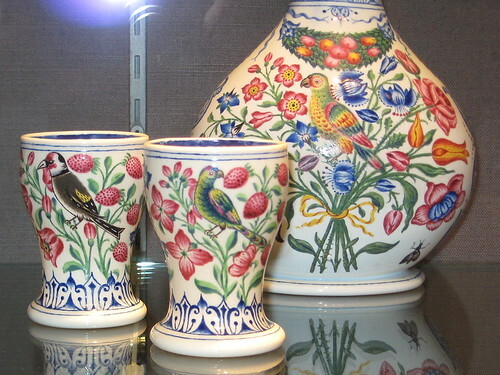 Paints, gold leaf, crushed glass, mosaic tiles, and other additions were introduced to the Art of glassmaking. The Museum had a wonderful time line on the walls, with key dates and accompanying pictures. The photo I took of a doctor has nothing to do with glass, but I was flabbergasted at the information. A doctor would dress like that to prevent infection?! That guy looks more like those Egyptian gods with the creepy jackal and eagle heads. It would seem that a doctor dressing in such a way had more to do with superstition than sanitation. Weird! 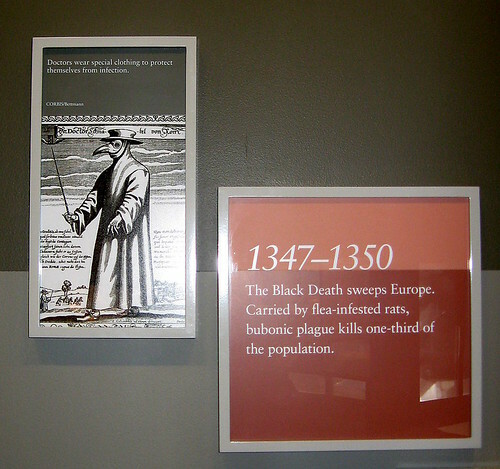 And imagine suffering from the Black Death and seeing that thing coming to “help” you. Yow. When we reached the section of the Renaissance and after, it is no surprise to see an explosion in beautiful, delicate glass art. Here’s a photo of some delightfully colorful pieces I liked. 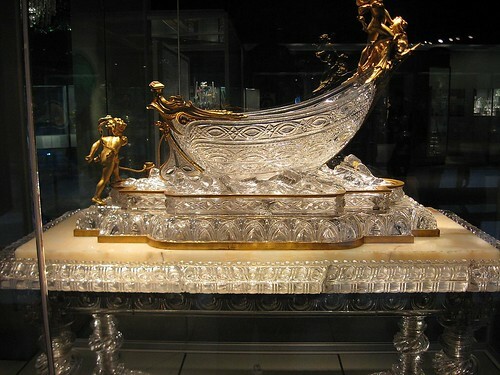 Here’s an enormous glass table with a gilded dish on top. I could only snap a few photos, because we were so busy gasping at the most exquisite pieces. 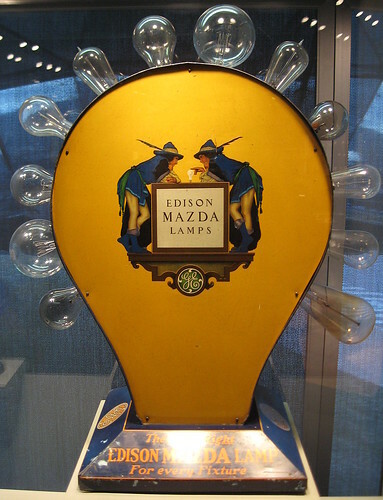 The wealth and luxury of design was truly overwhelming. One table from Russia was cobalt blue and had a swirled amber base, with glittering gold all around its edges– all glass. German wooden clocks had glass insets. Asian glass beads were set into the smallest brooches. The craftsmanship was truly astounding. Even now I am speechless to try to describe the most beautiful works of art I have ever seen. 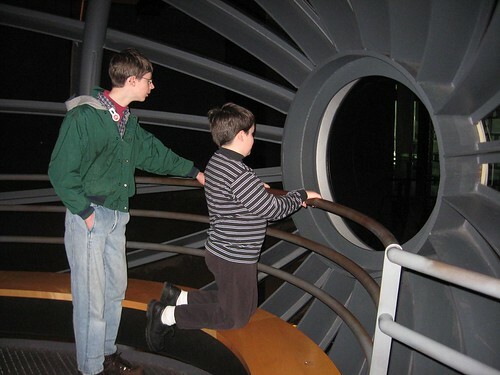 You really must spend some time at the Museum’s website to get a taste of the glass. 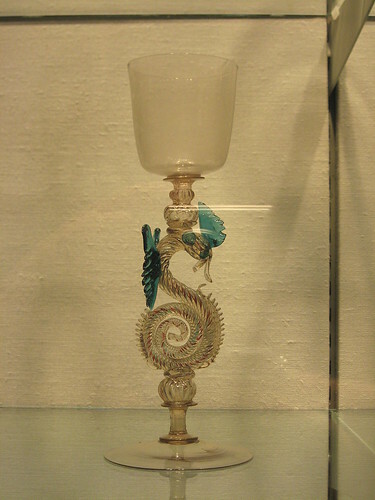 We especially loved the Venetian glass. There were bowls, cups, pitchers, jewelry, hairpieces, medieval grottos, tables, chairs, mirrors, a mechanical glass theatre, medallions, even glass slippers! It was all so lovely. We reached the American time period. The change was distinct. Gone were the curly and gilded Venetian goblets, and here were the practical, basic glass implements for practical living. As much as I like Americanism and practical living, the change from elegance and color to plain functionalism was disappointing. American glass was largely heavy, brown, and invariably stamped with a company name. Once in a while we did find a whimsical piece. The modern pieces toward the end of the glass art chronology devolved into chaotic blobs. I dislike modern art very much for its perversity and vulgarity, and unfortunately, modern art in glass didn’t inspire me to change my opinion. Thus ended our excursion into the history and development of glassmaking. I wish I had taken more photos, but the selection was enormous, and we were only halfway through the Museum yet! 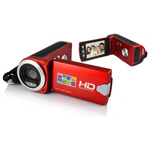 By the way, you can find several more video shorts here at the Museum’s website. They are excellent for learning more about glassmaking. Our next stop was to the Innovation Room. 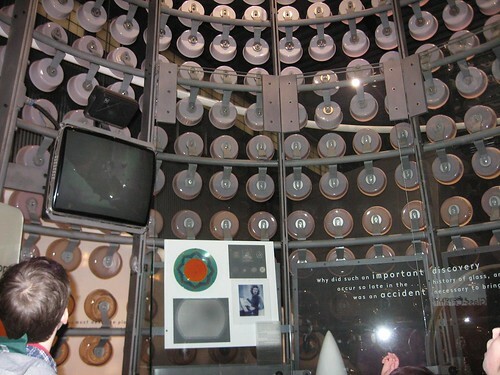 This was a place for kids– and for crazy adults like me! We had a blast in here! 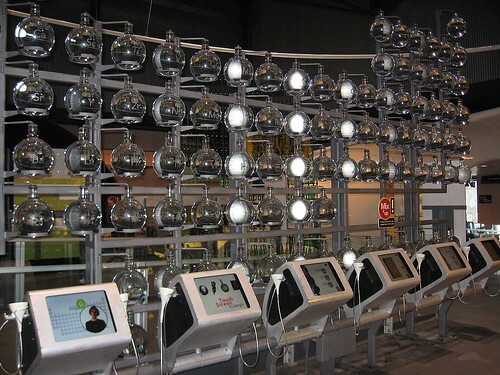 This section of the Museum taught and emphasized the scientific and technological development of glass in our modern age. The Corning Glass Works (now Corning, Incorporated) has contributed many important inventions and uses for glass over the century. 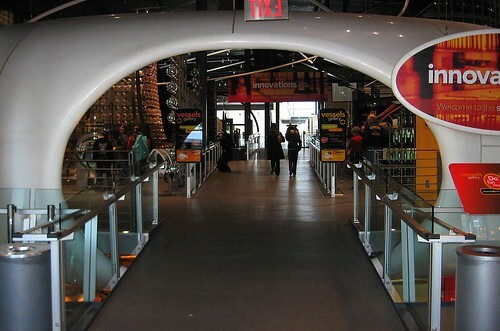 This Innovation Room educated you about the invention and use of glass for home and outer space. For example, there was an interesting display about fiberglass for home and for commercial use (I didn’t know they tried to make a dress from fiberglass– ouch!). Corning was an early manufacturer of television tubes, they also invented optic fibers, and developed the famous Pyrex and Corelle dishware. If you interested in the business itself, here’s their website. Here’s the display about the fiber optics. Those rusty colored round things are copper cables. 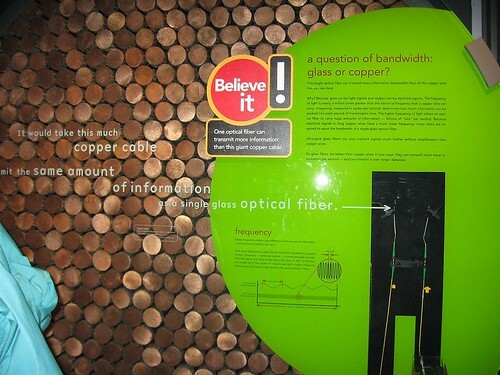 The display read that it would take “this much copper cable to transmit the same amount of information” as that narrow sliver of fiber optics in the box next to it. Amazing! Here’s a big display of Pyrex casserole dishes. With each level up, the composition of the glass is changed (more quartz or less silica, for example). This depicts how variable the ingredients can be for certain types of glass objects, making some more durable than others. We continued to investigate the millions of things to investigate here. Here we are in an egg-shaped room that had videos teaching us about the development of the light bulb glass. There was so much to see and do in this Innovation Room that I can’t blog about it all here. I will continue the rest of our visit in Part 3 of this series. For now, however, I’ll leave you with a cute video of our own discovery of the Disappearing LCD Glass! It was so much fun! We played with this thing for a long time, coming up with playful scenarios of someone walking through a door and getting bonked when the LCD glass reappears, etc. Part 3 will have more photos and videos, so see you there! If you and your family love to do last minute travel, let our website find the best vacations for you. Whether you are interested in finding last minute cruises, or you are interested in cheap ski vacations, the internet has the best deals for you!